Most of the country's national parks receive the vast majority of their traffic in the spring, summer, and fall. For winter adventure lovers looking for snow, this seasonal trend presents phenomenal opportunities to snowshoe and ski in some absolutely stunning terrain without the crowds. There can be trade-offs, to be sure; many campgrounds and lodges close for the season, and road access can be a logistic hurdle if certain arteries through a park are not plowed or maintained. But any extra effort required for a winter trip is easily offset by pristine views of a snowy and undeveloped landscape. Whether your fix is found with a quiet lunch near a glassy alpine lake or some deep turns in untracked backcountry stashes, national parks are almost certain to have a great adventure option for you. Here are a few ideas from some of the West’s magnificent national parks to get your planning process started. Paradise Valley Snowshoe: This short loop leaves from Paradise Inn and leads to Narada Falls. Paradise Snowplay Sleddding Area: Come visit the only legal spot to sled in the park! The National Park service clears the runs, and a few facilities are on hand for the kids. Edith Creek Basin: Easily one of the park’s best backcountry destinations. Low angle slopes and the nearby Paradise Lodge make this a great spot for learning, and the terrain’s diversity offers a match for skiers of all abilities. Skinning into Edith Creek Basin. Photo by Benjamin Krause. The Watchman Snowshoe: Snowshoe or ski a little more than 3 miles in for perhaps the best views in Crater Lake National Park. 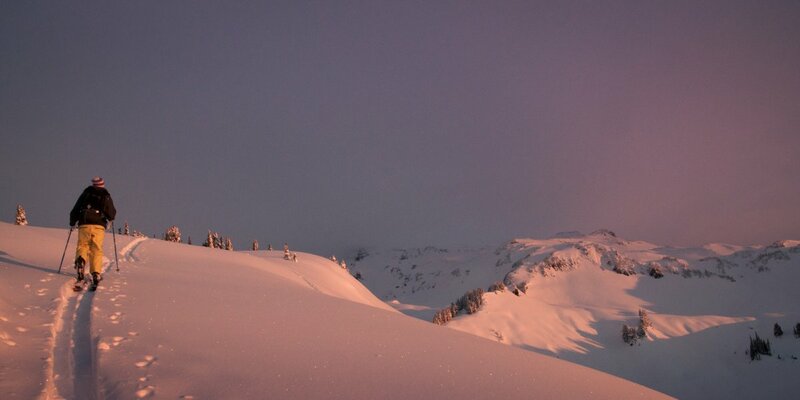 Garfield Peak Snowshoe: Extensive views from the crater rim and peaceful, open meadows leading up to the highpoint. Lassen Southwest Entrance Winter Recreation Area: Regular snowplowing up to the Kohm Ya-mah-nee Visitor Center keeps this area an accessible hub for sledding, snowshoeing, cross-country skiing, and backcountry touring. Lassen Peak, Southeast Chutes: If you can find access to the Devastated Area, Lassen’s Southeast Chutes offer plenty of options. Avalanche exposure makes terrain and conditions evaluations critical here. Mount Diller: A 400-foot chute sits on Diller’s southwest aspect, and bowls await on the north aspect. Access is via the visitor center. 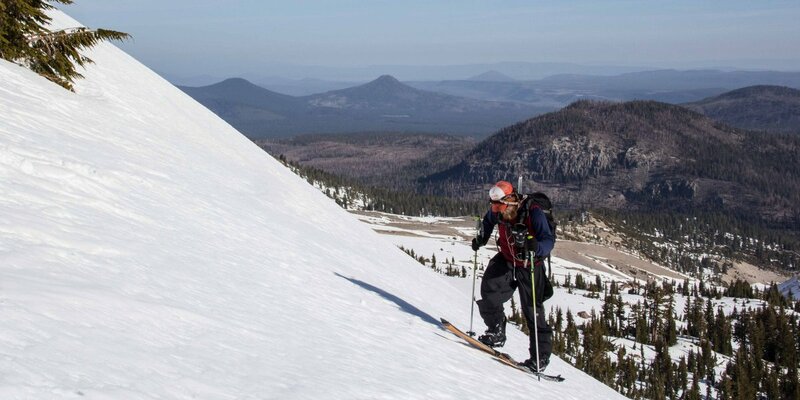 Skinning across Lassen's east-facing slopes. Photo by Aron Bosworth. Wolverton to Pear Lake Ski Hut: This 6-mile, 2,300-foot climb to the Pear Lake Ski Hut is worth every bit of effort. Absolutely stunning scenery in the heart of Sequoia National Park. Winter Alta: While you’re at the hut…enjoy incredible views and 2,000 feet of vertical at Winter Alta, one of the best runs in the Sierra. Note: Winter backcountry adventures can be dangerous outdoor activities that pose significant risks as conditions affecting safety (i.e. weather, snowpack stability, avalanche hazard) are constantly changing. Prior to engaging in these activities each individual should get the proper training to make safe decisions and be equipped to use avalanche safety resources and tools. Please visit our Backcountry Skiing and Avalanche Safety post to learn more.